Please read the following disclaimers, terms and conditions which govern your relationship with Lawyers’ Legal Research and Writing (“LLRW”) and your use of www.lawyerslegalresearch.com (“Lawyerslegalresearch.com” or “this website”). For the purposes of these disclaimers, terms and conditions, the terms “LLRW”, “Lawyerslegalresearch.com” and “this Website” refer to the owner of this Website, Roger T. Manwaring, whose business address is 365 Boston Post road, Suite 221, Sudbury, MA 01776. The terms “attorney” or “you” mean the user or viewer of this Website, any attorney who contacts LLRW through any other means, or any attorney who contracts for the services of LLRW. “Client” means any such attorney’s client. This Website presents general information about LLRW and is not intended as legal advice, nor should you consider it such. The articles and blog entries on this site are neither advice nor opinion on specific legal questions, but are furnished only as general information on areas of interest. The applicability of the legal principles discussed in the articles, blog entries or elsewhere on this Website may differ widely in specific situations. Therefore, the information contained in the articles, blog entries or elsewhere on this Website cannot be construed as individual legal advice. LLRW uses reasonable efforts in researching, collecting, preparing and providing quality information and material on this Website, but LLRW does not warrant or guarantee the accuracy, completeness, adequacy, appropriateness, applicability or currency of the information contained in this Website, in websites linking to this Website, or in websites made available through links found either on this Website. Nor does LLRW warrant or guaranty the accuracy, completeness, adequacy, appropriateness, applicability or currency of the information, research product, or written product made available to attorneys either as users of this Website or by communications with LLRW entered into independent of the use of this Website, or otherwise. Users of information contained on this Website or on websites of any third-party whose website is made available through one or more links contained on this Website acknowledge that the information may contain inaccuracies or errors and do so at their own risk. In order to contract for LLRW’s services, an attorney must contact LLRW and must receive an engagement letter from LLRW. Whether you are a new or existing client of LLRW, LLRW cannot represent you on a new matter until it determines that there is no conflict of interest and that it is willing and otherwise able to accept the new engagement. Use of this Website does not create or constitute an offer or the acceptance of an offer, nor does use of this Website create a contract for services of any kind. Neither the transmission alone nor the receipt alone (nor the mere transmission and receipt) of information to or from LLRW constitutes either an attorney-client relationship or a contract between the sender and receiver. LLRW provides legal services only to other attorneys and does not enter into any relationship with the clients of the attorneys to whom it provides services. LLRW does not engage in the practice of law on behalf of your client. LLRW provides legal research and writing services to you, the attorney to help you better represent your client. LLRW does not provide legal advice or legal opinion to your client. Briefs and memoranda that LLRW prepares are provided solely for review by the requesting attorney. Attorneys using the services of LLRW are ultimately responsible to their clients for the use or non-use of any work product prepared or provided by LLRW. An attorney should not act upon information, research product, or written materials obtained through the services of LLRW, or refrain from acting, without making a professional determination of the relevance, accuracy, completeness, adequacy, appropriateness, applicability, and currency of the information, product, and materials. Any attorney contracting with LLRW agrees to retain all of the duties and responsibilities associated with the attorney-client relationships in which he or she is engaged. LLRW provides its services only for attorneys who are active members of the bar of the Commonwealth of Massachusetts. If you are not an attorney and are seeking legal assistance or advice, you should contact an attorney licensed to practice in your jurisdiction. THE MATERIALS IN THIS WEBSITE ARE PROVIDED “AS IS” AND WITHOUT WARRANTIES OF ANY KIND, EITHER EXPRESS OR IMPLIED. TO THE FULLEST EXTENT PERMISSIBLE PURSUANT TO APPLICABLE LAW, LLRW DISCLAIMS ALL WARRANTIES, EXPRESS OR IMPLIED, INCLUDING, BUT NOT LIMITED TO, IMPLIED WARRANTIES OF MERCHANTABILITY AND FITNESS FOR A PARTICULAR PURPOSE. LLRW DOES NOT WARRANT THAT THE FUNCTIONS OF THIS WEBSITE WILL BE UNINTERRUPTED OR ERROR-FREE, THAT DEFECTS WILL BE CORRECTED, OR THAT THIS SITE OR THE SERVER OR SERVERS THAT MAKE LAWYERSLEGALRESEARCH.COM AVAILABLE ARE FREE OF VIRUSES OR OTHER HARMFUL COMPONENTS. LLRW DO NOT WARRANT OR MAKE ANY REPRESENTATIONS REGARDING THE USE OF THIS OR ANY OTHER WEBSITE OR THE RESULTS OF THE USE OF THE MATERIALS IN THIS WEBSITE IN TERMS OF THEIR CORRECTNESS, ACCURACY, RELIABILITY, OR OTHERWISE. YOU (NOT LLRW AND NOT LAWYERSLEGALRESEARCH.COM) ASSUME THE ENTIRE COST OF AND LIABILITY FOR ALL NECESSARY SERVICING, REPAIR, OR CORRECTION NECESSITATED BY USE OF THIS WEBSITE. APPLICABLE LAW MAY NOT ALLOW THE EXCLUSION OF IMPLIED WARRANTIES, SO THE ABOVE EXCLUSION MAY NOT APPLY TO YOU. UNDER NO CIRCUMSTANCES, INCLUDING, BUT NOT LIMITED TO, NEGLIGENCE, SHALL LLRW BE LIABLE FOR ANY SPECIAL OR CONSEQUENTIAL DAMAGES THAT RESULT FROM THE USE OF, OR THE INABILITY TO USE, (1) THE MATERIALS IN THIS WEBSITE, (2) THE RESEARCH AND WRITING PRODUCT PRODUCED FOR YOU BY LLRW, EVEN IF LLRW OR AN AUTHORIZED REPRESENTATIVE OR LLRW HAS BEEN ADVISED OF THE POSSIBILITY OF SUCH DAMAGES. APPLICABLE LAW MAY NOT ALLOW THE LIMITATION OR EXCLUSION OF LIABILITY OR INCIDENTAL OR CONSEQUENTIAL DAMAGES, SO THE ABOVE LIMITATION OR EXCLUSION MAY NOT APPLY TO YOU. IN NO EVENT SHALL LLRW’S OR LAWYERSLEGALRESEARCH.COM’S TOTAL LIABILITY TO YOU FOR ALL DAMAGES, LOSSES, AND CAUSES OF ACTION (WHETHER IN CONTRACT, TORT (INCLUDING, BUT NOT LIMITED TO, NEGLIGENCE), OR OTHERWISE) EXCEED THE AMOUNT PAID BY YOU, IF ANY, FOR RESEARCH OR WRITING SERVICES PERFORMED FOR YOU. This Website may constitute attorney advertising. This website is not intended to communicate with anyone in a state or other jurisdiction where such a website may fail to comply with all laws and ethical rules of that state or jurisdiction. Any reference made by this Website to any specific commercial product, process, or service (or to the provider of such product, process or service) by trade name, trademark, hyperlink, or otherwise, does not constitute or imply an endorsement, recommendation, or favoring by LLRW. Unless otherwise noted, all materials, including images, illustrations, designs, icons, photographs, video clips, and written and other materials that are part of this Website are copyrights, trademarks, service marks, trade dress, or other intellectual property (or combination thereof) owned, controlled or licensed by LLRW, or are in the public domain. No material from this Website may be copied, republished, reproduced, transmitted, uploaded, posted, or distributed in any way; provided, however, that you may download one copy of the materials on any single computer for your personal, non-commercial use only, provided you keep intact all copyright and other proprietary notices. The relationship between LLRW and any user of Lawyerslegalresearch.com, and rights and duties of the respective parties, shall be governed by and construed in accordance with the laws of the Commonwealth of Massachusetts, without regard to the conflict of laws principles thereof or of any other jurisdiction. Unless otherwise specified, the materials in this Website are presented solely for the purpose of promoting services available in Massachusetts. 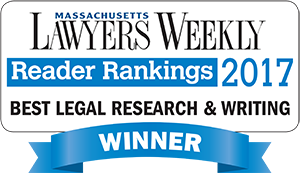 Lawyerslegalresearch.com is controlled and operated by LLRW from its offices within the Commonwealth of Massachusetts. By accessing Lawyerslegalresearch.com, you agree that the laws of the Commonwealth of Massachusetts, without regard to the conflict of laws principles thereof or of any other jurisdiction, will apply to all matters relating to use of Lawyerslegalresearch.com. In the event of a dispute, you agree to submit to the exclusive personal jurisdiction and venue of the courts of Middlesex County, Massachusetts, and the United States District Court for the District of Massachusetts with respect to such dispute.